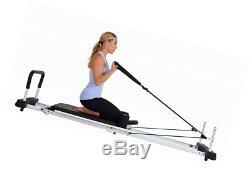 AeroPilates by Stamina 5 Cord Reformer. 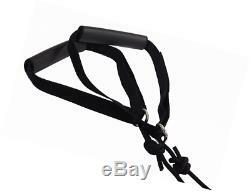 Adjustable resistance with 5 medium-resistance, elastic bungee cords; padded black platform (23.5" wide); taller (2") cardio Rebounder; padded, flared, wider foot bar - High density foam shoulder pads; padded, 3-position adjustable head rest; six non-skid supports, two on each end and two in the middle, for added stability - Padded hand & foot straps for added comfort; pulley risers for adjustable strap height; standing platform with textured surface for better balance and control - 2 DVD's with 3 workouts; aero Pilates Full-color workout wall Chart; foldable frame with wheels for easy portability and storage - Supports up to 350 lbs. 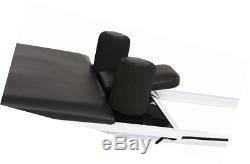 Dimensions Assembled: 85"l x 23"W x 20"H; Dimensions folded: 44"l x 23"W x 9"H; needs large stand (55-4150). 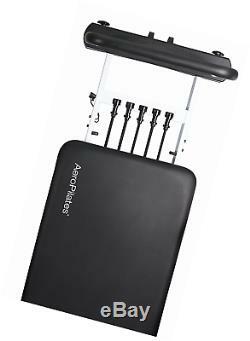 More customization means burning more fat: with the aero Pilates 5-cord Reformer, you can make your workout as intense or easy as you desire. Using more cords is harder on the major mobilizing muscles while fewer cords make the exercise more intense on the core. 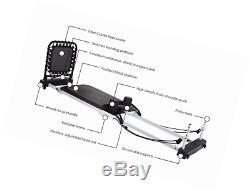 You can further customize your workout by utilizing either the wider, flared foot bar or aero Pilates' taller, patented cardio rebounder. 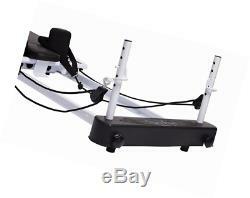 Upgraded to accommodate you: in addition to the cardio rebounder and foot bar, the aero Pilates 5-cord Reformer has many other extra features including a wider platform for more upper body space, a standing platform to challenge your balance, fur hand grips and a sturdy steel frame capable of supporting 350 lbs. Even more, the pulley risers allow you to adjust the height of the straps, which alters the angle and intensity of each exercise. Motivation to keep rebounding: with the two workout DVD featuring marjolein brugman, you'll be even more motivated to use your Pilates Reformer. The basic workout package DVD includes two beginner workouts featuring marjolein brugman and skylar rote. The basic aero Pilates workout uses the cardio rebounder and the foot bar for a well-rounded strength, flexibility, and cardio workout. The basic cardio workout is a simple and effective workout using the cardio rebounder to get your heart pumping and the fat burning. These DVDs also include information on the theories and benefits of aero Pilates, a machine overview, spinal movements, familiar terms, rebounding, safety tips and simple rules of body placement. Some might go up to 3 years, but they would never be less than 12 months. All orders are automatically processed. We offer cheap 2-Days Air services in case you want your item sooner. Initial tracking might not be correct, and it would up to 14 days. Those item might take longer. And we might have to cancel those order if no ground transport available. We use automatic tracking upload system, so. Sometime the initial tracking might not be correct. We will fix it asap. We do our best to process as quickly as possible. A - We offer to return the items within 30 days. We will do our best to resolve any problem or answer any question as soon as possible. PLEASE NOTE that your feedback is very important to us. Without your feedback our business can't exist. So, if you think that we've done a good job, we would really appreciate it if you would leave us your feedback. We love our customers and will always be here if you need us. We are not responsible if the item is hold/collected by custom of your country. Please make sure the product are legal to imported to you country. 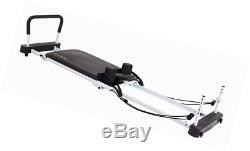 The item "AeroPilates 5-Cord Reformer" is in sale since Monday, January 01, 2018. 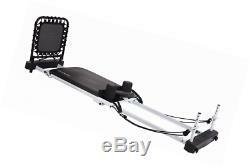 This item is in the category "Sporting Goods\Fitness, Running & Yoga\Yoga & Pilates\Pilates Tables". The seller is "mommi_shop" and is located in Multiple Locations. This item can be shipped worldwide.